Doberman Pinscher Puppies For Sale $3500. 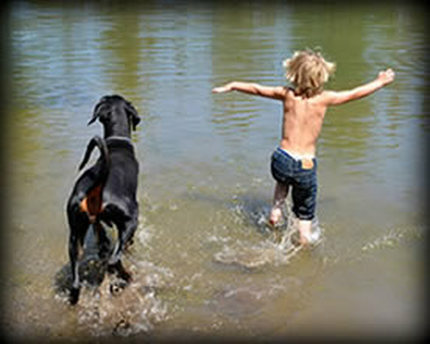 ​Unique Dobermans is dedicated to the preservation of the True and Original Doberman... They are not for everybody. Working with our World Class Doberman Breeder Friends in Germany and Europe gives us the ability to share our lives with these amazing Imported Champion Doberman females and Imported Champion Doberman male Dracula here with us on our 10 acre horse ranch, this also gave us the ability to occasionally produce a top quality, healthy and mentally sound litter of Doberman Puppies for your showing and companion / protection pleasure and enjoyment. First and foremost our Dobermans that we live and travel with are our constant companions and protectors, they make us laugh and bring us indescribably joy and affection each and every day. 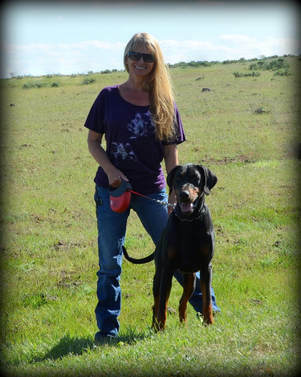 ​Sharing an occasional litter of Doberman puppies with a select few qualified homes gives us great satisfaction knowing others can experience the amazing feelings of pride and protection only a well bred Doberman can provide. 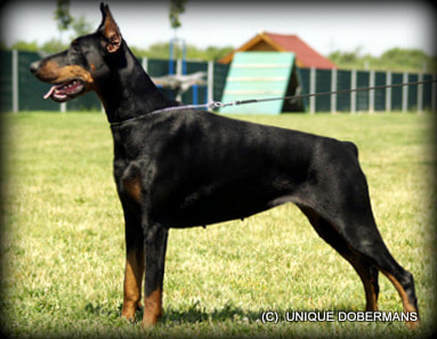 Unique Doberman Pinscher females are not only beautiful, they also possess correct conformation needed to perform the strenuous physical and mental tasks of protecting your family, they are proven working dogs that have courage and hardness of character to be able to protect you and your family in any situation that may arise. Our FCI / AKC Registered Dobermans are backed with the world's best breeder support and knowledgeable advice when needed. We have carefully hand selected these champion show titled imported females from the World's Best Doberman Breeders and Judges of Dobermans. Our Doberman Females represent some of the finest IPO / Schutzhund working and IDC World Show quality Doberman Pinscher bloodlines available. ​If you desire a stable and sound family companion and protector or a top working sport-dog give us a call or send us an email so we can best help you determine if one of our Doberman puppies for sale will be suitable for your expectations, family, home and lifestyle. Every Doberman puppy for sale at Unique Dobermans has been thoughtfully and carefully planned and considered long before the breeding has taken place. Your new Unique Doberman puppy (if you are so lucky to be chosen as one of our elite Doberman puppy owners) comes with a pedigree sporting German and European Dobermanns full of world champion show dogs plus each one has been worked to at least a BH in Schutzhund, IPO, Personal Protection sports and competitions. What do all of these Doberman working titles and Doberman show titles actually mean to you as a "pet owner" that doesn't plan on showing your Doberman puppy? EVERYTHING! Your new Doberman Puppy's parents have passed strict temperament testing, tracking trials and personal protection training. The genetics behind your Unique Doberman puppy shows that his genes are free of hip dysplasia, eye diseases, bad temperament and poor conformation. A Doberman dog that cannot hold up to the extreme athleticism that is required to obtain working titles is a poorly conformed dog and will break down, a Doberman dog that will not readily willing to obediently obey and have a strong desire to please it's master is not a pleasant Doberman to live with inside the home and certainly will never be able to obtain these titles.